Brides in the initial steps of flower selection sometimes overlook the filler flowers that add texture and bulk to their wedding flower arrangements. There’s so much more to filler flowers than the traditional baby's breath, and you should learn about the meaning, color choices, and fragrance of these delicate but important blooms to help you customize your bouquets and centerpieces. Including filler flowers can also help you stay on a budget, allowing you to allocate funds for more expensive flowers like orchids or peonies in your arrangements. 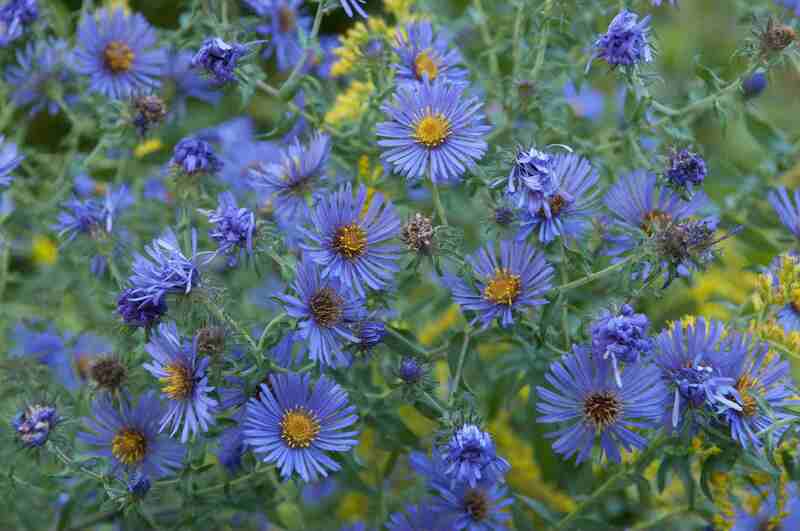 A seasonal fall flower, asters have a miniature daisy shape that complements any casual hand-tied wedding bouquet. The flowers may have pink, violet, or white petals, and feature tiny yellow button centers. Brides considering an outdoor wedding should be aware that fresh asters are a bee magnet, so may not be a good choice if anyone in the wedding party has a bee allergy. White baby’s breath flowers are a familiar choice for adding mass to floral arrangements, but the flowers are easy to tint in any color, increasing their versatility for your wedding day. Also known as gypsophila, baby’s breath flowers are available in single or double varieties. Representing enthusiasm in the language of flowers, the soft scent of bouvardia blooms can add white, red, yellow or pink accents to your wedding flower arrangements. The tubular blooms terminate in a star shape and attract hummingbirds where they grow in Mexico, Texas, and Arizona. Bouvardia is a hardy cut flower, and may still look vibrant up to two weeks after your nuptials. The dramatic spears of delphinium blossoms deliver the true blue color many brides seek, without the need for artificial dye. The stems are cloaked in flowers, and the buds open from the top of the stem downward. Your florist can choose small delphinium varieties, around 18 inches, for bouquets, and long stems up to four feet for dramatic tablescapes. The delicate spring bells of lily of the valley flowers have always been en vogue for wedding arrangements, but Kate Middleton's emphasis on this bloom in her wedding bouquet renewed the popularity of this filler flower. Because of the petite form of lily of the valley flowers, they look best in small bridal bouquets paired with other small to medium-sized flowers. Lily of the valley packs a big fragrance for a small flower, and has been replicated by many perfumers to give brides a sweet memory of their special day. Limonium, or statice flowers, feature papery bracts in Easter egg colors. The flowers are budget-friendly and available all year. Some statice varieties have a musty odor that isn’t apparent unless you’re in close contact with the flowers, so preview the flowers with your florist before you decide whether to include them in corsages or bouquets. Queen Anne’s lace has large, flat-topped flowers that create great mass while still looking airy and delicate. This summer bloom is a common wildflower everywhere and is a budget-conscious way to fill out your table centerpieces and bouquets. You may see the white flowers of Queen Anne’s lace sold under the name Ammi Majus. With their vibrant, almost neon colors and face-like blooms, snapdragons make an impression with just a few stems. Because snapdragons are easy to cultivate in the greenhouse, they are available to brides all year at a reasonable cost. Snapdragons have a very light fragrance that won't clash with other flowers. You may not think of roses as a filler flower, but spray roses have several small blooms on each stem that can add bulk to a wedding bouquet or centerpiece. The buds on spray roses will continue to open after the blooms are cut from the plant, creating a very full and lush look in wedding bouquets. The Madagascar jasmine flower represents marital harmony and adds its sweet jasmine perfume to bridal bouquets. Florists can add rhinestones or pearls to the hollow center of these petite blooms for added bling. Unlike large sprays of filler flowers, the stephanotis is a specialty flower that sometimes requires placement with wire or glue into a bouquet or corsage due to its small stems. Using stock as a filler flower is an excellent way to up the fragrance quotient of larger flowers that don’t have much scent, like gerbera daisies or hydrangeas. The ruffled petals also pair well with springtime favorites like tulips or peonies. Stock flowers come in a wide range of hues, including pink, white, yellow, red, purple, and burgundy. Like roses, thistles have thorns along their stems. The spiky blue flowers are very sculptural, and add interest to both flowers with clean lines, like calla lilies, or mixed bouquets. Look for tinted thistles in silver or white for a winter wedding. Trachelium flowers are tiny but very dense, creating a romantic cloud-like effect in your wedding bouquet or centerpiece. The purple, green, or white flowers have little fragrance, so won’t compete with fragrant lilies or peonies in your wedding flower arrangement. If the name trachelium doesn’t seem to roll off the tongue, you’ll understand why common name “throatwort” isn’t often used in the trade. The tiny five-petaled blooms of wax flowers often sport a contrasting throat, packing a big style punch into a myriad of little blossoms. Although the white, pink, or lavender flowers have little scent, the needle-like leaves have a resinous fragrance when bruised or cut. This Australian native isn’t related to the Hoya flower, also known as wax flower. You can refer to the plant by its Latin name, ​chamelaucium, to avoid confusion.